After identifying what looks like Morse code patterns on the surface of Mars, alien seekers and UFO enthusiasts across the world have been going nuts with excitement, convinced that this is final proof of intelligent civilization elsewhere in the Universe. A huge area of dunes in a crater on the surface of the Red Planet has what appear to be a series of dots and dashes. According to NASA scientists, the strange patterns have formed because the limited amount of sand is more likely to turn into these bizarre shapes when the wind blows, especially when it is bi-directional. 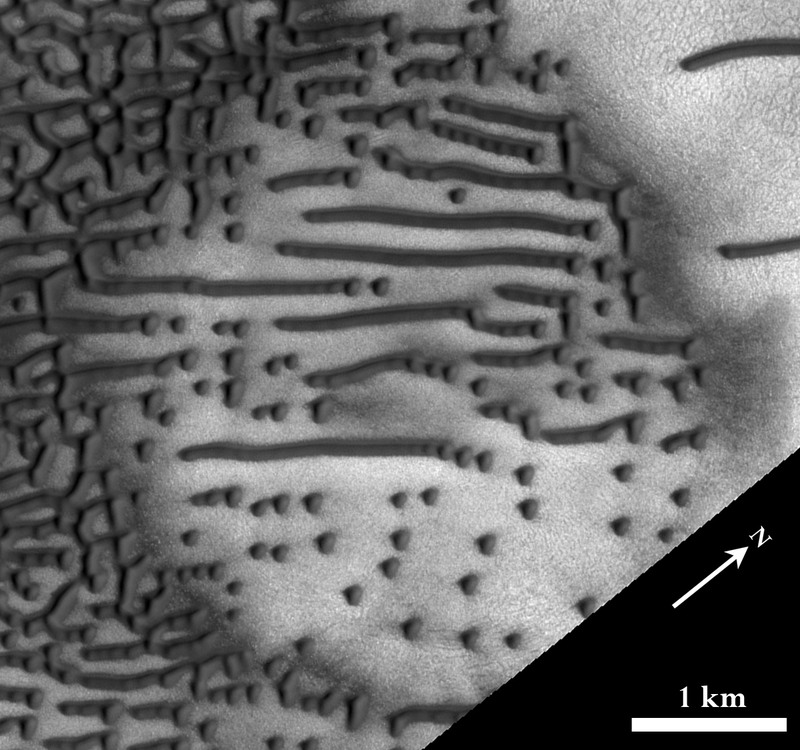 According to scientists in charge of HiRISE (High Resolution Imaging Science Experiment), a camera on board the Mars Reconnaissance Orbiter, these dark dunes are influenced by local topography (the arrangement of the natural and artificial physical features of the area). The Mars Reconnaissance Orbiter (MRO) is a $720 million, multipurpose spacecraft designed to study the Red Planet from orbit. It was launched in August 2005 and attained Martian orbit in March 2006. It contains a host of scientific instruments, such as a radar, spectrometers, and several cameras including HiRISE, the one that captured the image of the Morse code shapes. The shape of dunes as well as their orientation can generally tell us about wind direction. 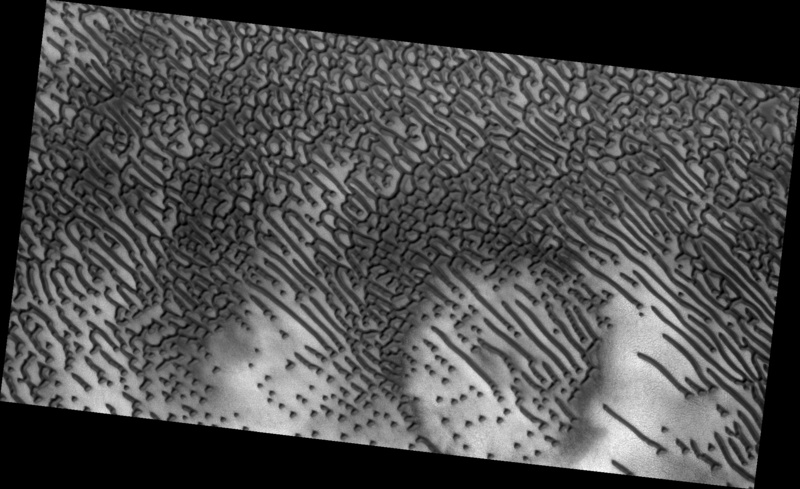 The problem with this image, however, is that the dune forms are extremely complex, so it is hard to know the wind direction, say the HiRISE Targeting Specialists. A circular depression, which is probably an old and infilled impact crater, does not have much sand for dune formation. Add to this the limited wind, and you get a series of dunes made up of dots and dashes. The prospect of there being life on Mars has been a theme that has consumed the thoughts of thousands of scientists and alien enthusiasts for years. In fact, many enthusiasts believe we already have proof observed in some of the images sent back from the Mars rovers – the robotic vehicles on the planet’s surface. However, NASA insists this is not the case – their scientists say no proof of life has been found there yet. The airborne SOFIA telescope in May this year found oxygen atoms in the planet’s atmosphere. For life as we know it to exist on another planet, three things need to be present: 1. The right temperature. 2. Oxygen. 3. Water. Evidence has been found of water on and in the planet, the temperature is within the range of what we call a ‘habitable planet’. SOFIA, a telescope which operates aboard a plane, discovered methane in Mars’ atmosphere, a gas which is commonly released by microbes and living creatures. The oxygen discovered there contains one less atom than the O2 that animals including humans on Earth breathe, but it can lead to the creation of an ozone layer, which would protect the Red Planet from damaging ultraviolet light, making it possible for life as we know it to exist. This video shows the image from different angles of the dunes on Mars that look amazingly like Morse Code dots and dashes.